PC may have gotten Warframe's Sanctuary Update back in March, but it just dropped last week for PS4 and Xbox One players. Sanctuary adds a slew of new content, improvements, and tweaks as well as the new Chroma Warframe. Warframe players will have to undergo the new quest ("the New Strange") in order to gain access to Chroma. They must be above Mastery Rank 5 and have the "Stolen Dreams" quest completed. Chroma's powers include Spectral Scream, Elemental Ward, Vex Armor, and Effigy. Check out the accompanying video for a closer look at these powers in depth. For players who are already happy with their choices of Warframe, Sanctuary still has a ton to offer. New weapons have been added to the game, such as Kohmak (a hand-shotgun) and Ripkas (saw fists). A neutral faction (Simaris) enters the game, focusing on lore via scanning targets in the world with the Synthesis Scanner. Players can receive Syndicate rewards for participating in Simaris tasks. New items are also available in the Market, like the Orokin color picker, new noggles, and new helmets. Two new trophies ("Tenno and Hooch" and "Egg Timer") have also been added for your trophying pleasure. And, of course, there's "PVP 2.0" (the updated PVP system for Warframe). 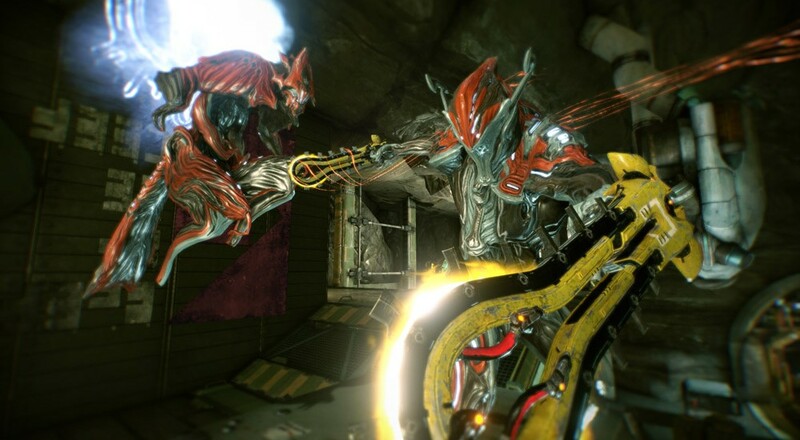 Warframe is currently available on PC, Xbox One, and PS4. It is a free-to-play action shooter which supports 4-player online co-op.